ProPresenter - Nelco Media, Inc. The definitive choice in live presentation and worship software for churches, schools, business presentations, and concerts. 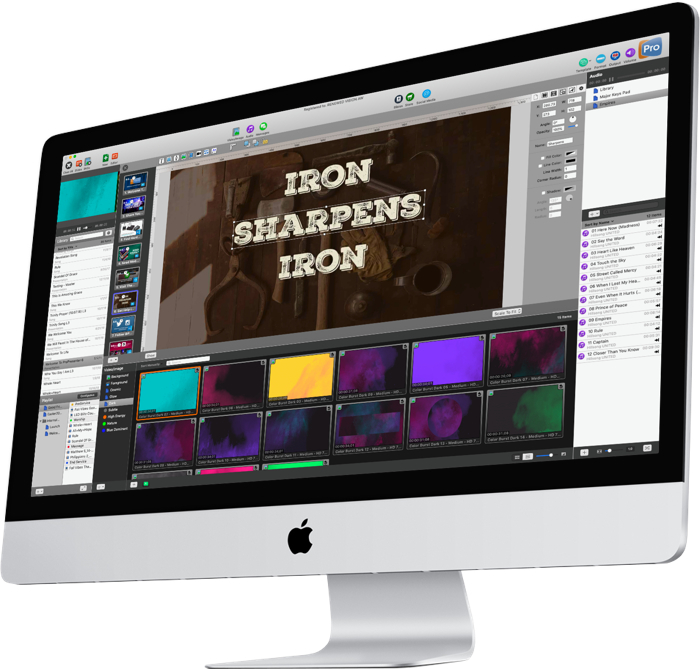 ProPresenter is a cross-platform (Mac and Windows) worship and presentation software for live events. It seamlessly displays lyrics and media specifically to make high-quality live productions easy – including worship gatherings, sporting events, conferences, trade shows, or studio broadcasts. ProPresenter operators control presentations on one screen, while dynamically presenting to an audience on one or more additional outputs. This means there is no separate “edit mode” or “presentation mode”, outputs are always live, and editing of one presentation can be done while another is being viewed. Originally designed for houses of worship, ProPresenter is now the choice for media presentations for trade shows, corporate events, sporting venues, and ministries all over the world. In version 6, ProPresenter gains even more tools for diverse productions and focuses on unparalleled video presentation quality, tighter social media integration, and enhanced editing tools. Whatever the story you are wanting to tell, ProPresenter 6 has the tools to help you tell it in the most engaging way possible. With a completely revamped video engine that is equally suitable for powering presentations in a room of 100 people or 100,000, the quality and professionalism of the output is unprecedented. The ability to create high-quality video is becoming increasingly easy, making the use of videos in productions more prevalent than ever. The ProPresenter video engine, re-engineered from the ground up in ProPresenter 6, makes simple video playback (which so often isn’t so simple) the perfect tool to present your final edit. You can import and play videos instantly in ProPresenter, with the ability to set in and out points dynamically, effect color, brightness, and volume, and crop/zoom videos dynamically from right within the software. Video effects empower you to leverage our video library to create limitless new looks for your pre-produced content. All of the tools ProPresenter has to effect pre-produced videos can also be used on live video sources. A multi-layered architecture allows for backgrounds, live video layers, slides, props, and masks to be controlled independently. High-quality transitions make the changeover from one element to another in any layer tasteful. Add more flexibility to your slides by setting transitions for individual slide elements, allowing you to build content on the screen in parts, instead of all at once. Scale and crop individual slide elements or set the opacity of individual slide elements. Dynamic slide “tickers” enable news-channel style scrolling messages across the screen. The props layer lets you dynamically overlay content on top of your videos or slides; such as a logo you may want to show in the bottom right corner, or notifications to your audience such as parent notices or alerts for a mis-parked car. Telestrator functionality even allows you to draw on your slides or videos dynamically, either right on the computer or via our ProPresenter Remote iOS/Android app. A sophisticated Stage Display output empowers you to communicate information to the people on stage valuable information to support the tasks that they do, including clocks, timers, current slide, next slide, slide notes, and stage announcements (ProPresenter 6 adds PCO Live and video mirroring support to the stage display output as well). Regardless of how powerful a tool is, it’s value is determined in how easy it is to access that power. ProPresenter was designed from the beginning to allow beginners to feel confident in running the software with only a few minutes of training, and we make all of our training available free online via video tutorials you can access before you even purchase the software. Here are just some of the ways that we make it easy for you to create the presentations that tell your story. It’s important that presentations have a consistent and uniform look. To this end, ProPresenter makes use of templates with which you can quickly create and transform your content to ensure everything looks right. Powerful importing tools including a text reflow editor that allows you to edit slides as easily as editing text in a word processor. Build slides with a variety of elements, including: shapes, text, graphics, videos, live video inputs, and even HTML5 web pages. ProPresenter 6 adds dynamic alignment guides and the ability to set the opacity of each object on a slide, as well as individual slide object builds – all in an intuitive, easy-to-use interface.